A recently discovered article from 2005 contained Steve's amazing words. One Heart Community Drumming is an open drum circle based in Ithaca, NY, welcoming all ages, levels of interest, and abilities. There is no specific "leader", rather we take turns facilitating the jam. It is helpful to bring your own drum but we usually have extras to share as well as shakers, bells etc. During warm months, we can be found SATURDAYS in the northwest corner of Stewart Park, 4 pm until dusk, by the beautiful Cayuga Lake (Google map link: http://tinyurl.com/stewartpark14850). We welcome children and adults alike of all skills and abilities. No drumming experience is necessary to participate. Essentially Steve's legacy is the creation of community through drum and dance and love. This we hope to continue doing. We all hope to continue Steve's legacy, his energy, his essence and most important his ability to love. The community we create through drumming, dancing and hooping together is a testament to Steve's energy and love and the benefit and joy of the community we create Steve's gift to us. It is not the material, nor the individual. It is the spiritual, it is community. It is love. One-Heart Community Drum began at the 1995 North East Regional Rainbow gathering in the summer of 1995, in the Finger Lakes National Forest, in Hector, NY. A group of people from the local area participated in some drum circles there, and had a blast. After the gathering ended, we began meeting in Stewart Park on Sundays, with families gathering, and sharing food, and drumming. At the end of the warm season, our drumming ended, until one of the members decided to have a meeting in their home to discuss finding an indoor location to drum during the winter. Steve Calkins worked at the Alternative Community School, and obtained the principal’s consented to use that space. In February of 1996 we began a weekly drum circle there that has existed since that time. 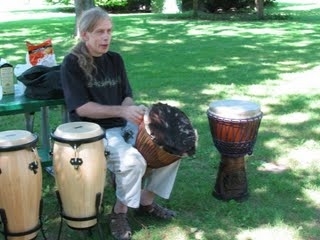 Our tradition of drumming at Stewart Park during warm months continued.